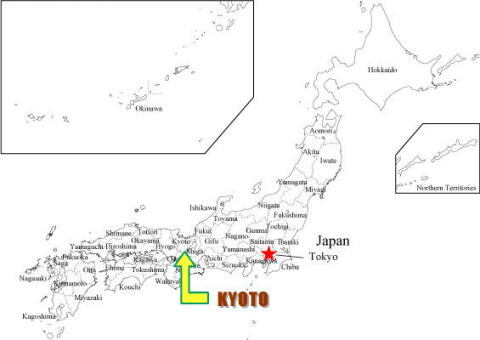 Historic Monuments of Ancient Kyoto consist of 17 properties (shrines, temples and castles) in Kyoto City, Uji City and Otsu City. Some have been reconstructed but original properties were built between 8th to 16th Centuries. In 1994, the year of 1200th anniversary of foundation of the Heian-kyo Capital City, Kyoto was registered as world heritage. The shrine buldings which take over the ancient style. This shrine is well-known as the setting for a variety of ritual ceremonies and festivals, including the Aoi Matsuri Festival, one of Kyoto's "Three Major Festivals". The model of the Honden built in the 'nagare' style all over Japan. As a guardian shrine during the establishment of the Heian-kyo, Kamomioya-jinja counted numerous worshippers among the artistocracy. Kamomioya-jinja hands down the traditions of various anicient arts, rites and festivals including the Aoi Matsuri Festival. As for the shrine's grove, several novels including Genji-monogatari (The Tale of Genji) refer Tadasu-no-Mori as a place of natural beauty which have various aspects of seasons. The only relic which indicates the position and the scale of the Heian-kyo. Kyo-o-gokoku-ji was one of the state-sponsored temples constructed for protecting the nation during the establishment of the Heian-kyo. Configuration of the buildings reflects the original layout of the temple, it is significant as a standard for Heian-kyo restorations. The Kondo (Main Hall) displays a magnificence and majesty characterristic of the Momoyama Period architecture. The five-storied pagoda is the tallest of all extant pagodas and a landmark of Kyoto. The beautiful buildings which match with the scenery of Higashiyama (east mountains). The Hondo, built in 1633, is the center of the temple compound and is an example of 'kakezukuri(overhang)' architecture. It is famous for its so-called 'Kiyomizu-dera stage', an imposing veranda supported by tall wooden columns with wooden braces running through them crosswise and lengthwise. The mother temple of Japanese Buddhism where great monks have appeared. The temple known as Hieizan-ji, was built by Saicho, the founder of the Tendai sect, as a temple to guard the Heian-kyo against the evil believed to enter from the northeast. Enryaku-ji developed into a center of monastic discipline that educated numerous great monks founded important Japanese Buddhist sects: eg. Honen, Eisai, Shinran, Dogen and Nichiren. Gojunoto (five-story pagoda) of Daigo-ji is the oldest building in Kyoto, and the garden is of the Momoyama Period. Daigo-ji is devided into two separate precincts: the upper precinct and the lower precinct at the western base of the mountain. The Gojunoto in the lower precinct, built in 951, is Kyoto's oldest reliably dated extant building. Majestic and unshakable in appearance, this pagoda reveals its origins as an estoeric Buddhist structure with the paintings of the mandalas inside on the ground floor. The Kondo (main hall) was built in the style of late Heian Period Buddhist halls. The Sampoin Omote-shoin (reception hall) and the magnificent garden lying next to it, also put in at the direct command of Hideyoshi, are an amalgam of the chisen-kaiyu (stroll garden with a pond) and karesansui (dry landscape) style. The Omuro Palace surround the atmosphere of the Heian imperial culture. The construction of Ninna-ji was initiated by Imperial command, and was completed in 888 under Emperor Uda. Also called the Omuro Palace, Ninna-ji is the foremost temple of the monzeki tradition, because an imperial son or other member of the imperial family served as the temple's abbot from generation to generation. Although the original Japanese cypress-bark roof of the large Kondo gave way to a hongawara-buki tiled roof, the building remains the characteristics of palace architecture in the Momoyama Period, e.g. enclosing shitomi-do or top-hinged, outswinging windows. The Ho-o-do (Phoenix Hall) is an airy and graceful structure comprising a central hall flanked by two wings with a corridor behind. The main roof of the central hall is ornamented at either end by a bronze figure of the phoenix-like mythological bird known as ho-o. The interior is adorned with an ornate double ciborium, hosoge designs, carved bodhisattvas and murals. In front of the Phoenix Hall lies a garden with a pond, intended to represent the Gokurakujodo (Pure Land Paradise). This garden is unique in incorporating the surrounding natural scenery, and is known as the "Jodo garden". The Byodo-in garden served as the prototype for the temple garden built around a central Amida Buddha hall. This is the oldest extant shrine buildings in Japan. Designated as a guardian shrine for Byodo-in during the Heian Period, the shrine attracted worshippers among the local residents, and the shrine buildings were carefully maintained. The specially designed Honden is believed to have been constructed in the late Heian Period, and is the oldest extant Shinto main shrine building. The Haiden (Worship Hall), built in the Kamakura Period, is older than any other extant Shinto worship halls as well. The graceful building which harmonizes with the natural scenery. The Sekisui-in is the only surviving structure that dates from Myoe Monk's time. Architectural techniques such as sugaru-hahu gables (leaning form) and various details of design represent the architecture of the Kamakura Period. Because it harmonizes with its natural surroudings, the Sekisui-in instills in the visitors relief, and which is a good example of an interesting aspect of Japanese culture. The great garden which exerted a great deal of influence on the later gardens. In garden history, the garden at Saiho-ji is important because it is the earliest example in Japan which contained intergreated buildings, strong stone works and viewpoints. It exerted a great deal of inflence on later gardens. The garden for appreciating in the great Zen temple. This dynamic and sophisticated garden is built around a pond with stone works forming Ryumon-baku waterfalls, stone bridges and rock islands. The emphasis on the view from the Hojo as well as its methods of arranging rock groupings exerted a significant influence on the stone works along ponds and karesansui (dry landscape) style rock gardens developed during the Muromachi Period. Originally built in the Kamakura Period as an aristocrat's coutry estate, and taken possession of in 1397 by retired shogun Ashikaga Yoshimitsu, who turned it into a supremely refined and elegant country villa called Kitayama-dono (the Kitayama Palace), Rokuon-ji's birth as a Buddhist temple occured in 1422, when, following Yoshimitsu's death, it was converted into a Zen temple, with the monk Muso Soseki as its founding abbot. 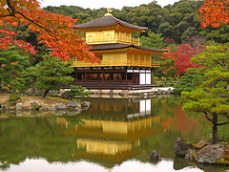 Whereas the temple later fell into decline, the Shariden (commnly known as Kinkaku or "Golden Pavilion") and temple gardens were largely restred during the Edo Period. The temple garden was designed to incorporate Mt. Kinugasayama as shakkei　(borrowed scenery). In the course of creating the garden, various selected rocks were installed in the existing pond; the Shariden was constructed at the edge of the pond; and a viewpoint was set at the top of the mountain. The Kinkaku, with its shingled roofs and with its second and third floors entirely gilded with gold, epitomizes the so-called "Kitayama culture" of the period, and reveals Yoshimitsu's dynastic aspirations. The simbol of the refined Higashiyama culture, the beauty of "Kotan-yugen" (profound and plain). Built in 1842 as a villa Higashiyama Palace at the base of the Higashiyama mountains by Shogun Ashikaga Yoshimasa, Jisho-ji was converted into a Zen temple following Yoshimasa's demise. With the Kannodo (Ginkaku or "Silver Pavilion"), the Togudo (Buddha hall) and other buildings situated around a pond, the Higashiyama Palace was in Yoshimasa's day a sort of elegant artistic salon. The Ginkaku, built in 1489, is a two-storied structure of which the ground floor is built in the wayo style of architecture known as the shoin or "library" style, while the second floor is built in the butsudo or "Buddha-hall" style of Zen architecture. The Togudo's tsukeshoin or reading platform and with chigaidana or staggered shelves which are the oldest extant examples of the shoin-zukuri style. The Garden is an example of the chisen-kaiyu (stroll garden with a pond) style which features a central pond with many superb rocks, trees and shrubs arranged around it. The details of its stone works exhibit an exquisite delicacy of design. The arstract formative of the white gravels and the rocks, the representative garden of the "karesansui" style. The temple garden is thought to date from the mid-15th century. A rock-and-gravel garden comprising 15 rocks in five groupings, arranged on a bed of white gravels, it is renowned throughout the world as an ultimate example of the karesansui (dry landscape) style rock garden, in which nature is compressed and given abstract expression within the confines of a very narrow space. The compilation on the gorgeous and splendor Momoyama culture. Hongwan-ji is the main temple of the Hongwan-ji subsect of the Jodo Shinshu sect founded by Shinran in 13th century. The Shoin, built in 1618 in the grand shoin-zukuri style, comprises the Taimenjo (Ko-no-ma) used for public receptions, and the private space of the Shiroshoin. The karesansui　(dry landscape) style rock garden known as the Kokei no Niwa is simple in structure, with representation of waterfalls, streams and ocean; at the same time, it expresses the boldness and grandeur of the Momoyama Period in its use of such elements as rocks and sago palms. The Hiunkaku is a three-storied structure overlooking the pond in the Tekisuien Garden and has the bizzare appearance and an airy structure. Nijo-jo was built by the Tokugawa shogunate in 1603 for the defense of the Kyoto Imperial Palace and to serve as an official residence for visiting shoguns. The Ninomaru Palace is an excellent example of the buke shoin-zukuri. Its principal buildings are laid out in a diagonal configuration along the pond in the Ninomaru Garden. Each room are magnificently adorned, each according to its intended use, with exquisitely painted walls and doors, caved transoms, ornamental metalwork, nail-head covering and so forth. The Ninomaru Garden composes in the chisen-kaiyu (stroll garden with a pond). With striking stone works on the banks, three islands and a three-tiered waterfall, this garden's dynamism of design accords well with the grandeur of the palace buildings.